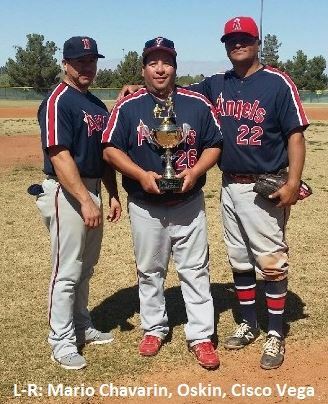 Daniel Arruda walked to start the bottom of the seventh inning and later came around to score the go ahead run to make it 2-0 in favor of the Montebello Angels, as they tried to hold on to their lead over the San Fernando Valley Bulldogs while heading into the final two innings of the 35-over national division of the 2015 MSBL Kickoff Classic. Things got a little shaky as the Bulldogs came right back in the top of the eighth to cut the lead to 2-1 but the Bulldogs stranded a runner in the top of the ninth and the Angels held on to claim the title, 2-1. The Angels scored their first run in the third inning with three singles, a stolen base and a walk as Frank Rodriguez came around to score after a leadoff single and a stolen base. A very timely 6-4-3 double play by the Bulldogs stopped any further damage. The Bulldogs had a runner on second base three times in the first seven innings before breaking through in the eighth but the Angels were able to dodge the bullet. Those are the plays that stick out when you win a championship game 2-1.Mom always said that defense wins ballgames!